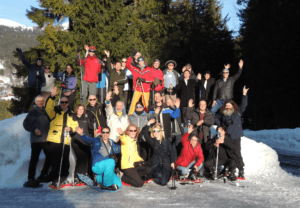 Last week saw the 10th Annual Winter School on Quantum Communications take place in the alpine resort of Les Diablerets. This year’s event, entitled “The Coming-of-Age of Quantum Cybersecurity” was the busiest yet. We welcomed over 30 delegates, from 13 countries, for six days of quantum learning – with a little leisure time thrown in for good measure. Over these last 10 years, we’ve seen quantum communication grow from infancy to what could be described as a ‘cheerful teenager’. Still an adolescent, but full of promise for the future, the Winter School provides attendees with an opportunity to learn about quantum communications from some of the industry’s best-known researchers and practitioners. 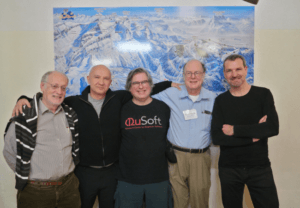 We were delighted to welcome quantum experts from around the world, including three very special guests: Charles Bennett and Gilles Brassard, early pioneers of quantum cryptography and teleportation (BB84 protocol), and Artur Ekert, the inventor of entanglement-based quantum cryptography (E91 protocol). These founding fathers offered unique insights into the history of quantum and their vision for the future. Their participation, alongside other distinguished speakers, added an extra “je ne sais quoi” to already lively discussions. As has become the custom, the Winter School began with a two-day executive track, which set the scene with high-level sessions, presented by experts from academia and industry. Michele Mosca (IQC Waterloo, Canada) kicked things off with an overview of the security threat posed by the quantum computer. He advocated for a quantum risk assessment and summarised how the introduction of hybrid systems, incorporating post-quantum algorithms and QKD, should mitigate the risks. Artur Ekert explained the basis of quantum computing and what it is that makes a quantum computer different from a classical one. Colin Williams (DWave) presented the first artificial quantum computer. Although the DWave system is not a universal computer (it cannot perform all types of computation), Colin was able to demonstrate several practical applications. Phil Zimmermann (PGP) discussed quantum computing and how post-quantum cryptography solutions will need to adapt to a range of future applications. This was, of course, wholeheartedly supported by Grégoire Ribordy (CEO of IDQ), who presented an overview of Quantum Key Distribution. Day two of the executive track focussed on the views of industry experts. Andrew Lord (BT) discussed the evolution of optical networks and explained how QKD should become part of the security infrastructure. He explained that QKD could not only be offered to end-users, but also used by operators – to secure the network itself. Finally, Jason Hart (Gemalto) explained that data is the key to today’s economy, and that it should be protected by the right keys! Although the prospect of a quantum hack is worrying, it wasn’t all bad news. Jason was also optimistic that as the field develops, data protection could come to be embedded into process management and provided transparently as a service to users. Over the following four days, delegates enjoyed the in-depth technical track, which offered a deeper dive into the topics raised in the executive track. Practical applications and hands-on sessions were the order of the day, as delegates had the chance to work with real quantum technologies. Special thanks go to our team of speakers: Sandu Popescu, Nicolas Gisin, Romain Alléaume, Renato Renner and of course our R&D team! We’d like to take one last opportunity to thank all the delegates and presenters for making Winter School 2018 such a success. If you missed out this year, there’s always 2019.